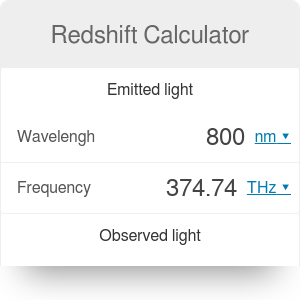 The redshift calculator will help you to estimate the redshift parameter z. The discovery of the redshift in astrophysics has become a crucial point in understanding the history of our universe. In the further text, we explain what redshift is and how you can estimate its magnitude using the mathematical redshift definition. Finally, we are also discussing differences between redshift and blueshift. relativistic Doppler effect - occurs whenever a light source moves away from an observer. You can check out our Doppler effect calculator which is a classical version of Doppler effect. expansion of the universe - the more distant galaxies are, the faster they seem to move away from us. gravitational effect - light loses energy by "overcoming" gravity of the star, i.e., the light increases its wavelength. λo and fo are respectively the wavelength and the frequency of observed light. The possibility to use both wavelength and frequency results from the Planck's equation. You can see from above redshift formula that the greater z, the bigger the difference between emitted and observed light. when a gravitational effect causes the shift, the light is emitted from a source with a weaker (blueshift) or a stronger (redshift) gravitational field than the gravitational field in which the observer resides. Redshift Calculator can be embedded on your website to enrich the content you wrote and make it easier for your visitors to understand your message.